The largest part of the German Empire, the Weimar Republic, and Nazi Germany from 1871 to 1945. In 1934 the Nazis stopped using the name Prussia for that area, and in 1947 the Allies abolished the state of Prussia, and divided its territory among the new States of Germany. Today the name is only for historical, geographical, or cultural use. From the late 18th century, this bigger Prussia had a lot of power in North Germany; it was the strongest in politics and economics, and it had the most people. In 1871 Otto von Bismarck created the German Empire, and Prussia was the center of the empire. Prussia was a small part of today’s northern Poland. After a small number of Prussi people lived there, Germans came to live there too. In 1934, Germany’s borders were with France, Belgium, the Netherlands, and Lithuania. Some parts of Prussia can be found in eastern Poland. Before 1918, a lot of western Poland was also in Prussia. Between 1795 and 1807, Prussia also controlled Warsaw and most of central Poland. However, some regions were never part of Prussia, such as Oldenburg, Mecklenburg, and the Hanse city-states. North-east Germany was Protestant, so Prussians were mostly Protestant. But there were a lot of Catholic people in the Rhineland, East Prussia, Posen, Silesia, West Prussia, and Ermland. The states of south Germany (especially Austria and Bavaria) were Catholic, so they did not want Prussia to have the power. Prussia was mostly German, but in the late 18th century the new Polish areas had a lot of Polish people too. In 1918, these Polish areas returned to Poland. In 1226 Polish Prince Conrad of Mazovia (a place in Northern Poland) asked the Teutonic Knights from Transylvania to come to Mazovia. He wanted them to fight the Prussian tribes on his borders. They fought for more than 100 years, then they created a new state. After some time, this state controlled most of today’s Estonia, Latvia, and Lithuania, and parts of northern Poland. From 1466, the Knights were under the King of Poland and Lithuania. In 1525 the leader of the Knights became a Protestant. He made part of the Knights' land into the Duchy of Prussia, in the Kingdom of Poland. At that time, the Duchy of Prussia was only the area east of the mouth of the Vistula River. In 1618 the new Duke of Prussia was the Elector John Sigismund of Brandenburg. He was also Margrave of Brandenburg. Brandenburg was under the Hohenzollern family. The Duchy of Prussia was important to the Hohenzollern family because it was not in the Holy Roman Empire. The name for the new state was Brandenburg-Prussia. In the middle of the state was Polish land, but Brandenburg-Prussia was moving away from Poland. Under Frederick William, the Great Elector, Prussia took some new land in Magdeburg and areas west of the Rhine. In 1701 the Holy Roman Emperor and Polish King allowed Brandenburg-Prussia to have the name "Kingdom of Prussia" under Frederick I. Under Frederick II ("the Great"), Prussia took Silesia from Austria by War and kept it. The wars ended in 1763; Prussia was now the most powerful state in eastern Germany. Other parts of Germany, including Pomerania, went to Prussia because of marriage or death. In this time, the Prussian military machine grew, as did the administration system. Until 1945 these were at the heart of the German state. Between 1772 and 1795 Prussia, Russia and Austria divided Poland into parts (the Partitions of Poland). Now Prussia controlled land in the far east, e.g. Warsaw. Frederick William II took Prussia into war with France in 1792. He lost at Valmy and gave his western land to France. Frederick William III started a new war, but lost at Jena. He gave more land to France at the Treaty of Tilsit. In 1813 Prussia again started war with Napoléonic France. In 1815 Prussia won her lost land again, and also all the Rhineland and Westphalia and some other land. This land in the west was very important, especially the Ruhr valley. It was the new centre of Germany's industrialisation, and the home of the weapons industry. After the Napoléonic Wars Prussia was the biggest power in Germany, and more powerful than Austria. In the early 19th century, the liberals in Germany wanted one federal, democratic Germany. The conservatives wanted Germany as a group of independent, weak states. In 1848 revolution came to Europe – the liberals had a chance. Frederick William IV was worried. He allowed a National Assembly and a constitution. The new Frankfurt Parliament wanted to give Frederick William the crown of all Germany, but he did not want it. He said that revolutionaries could not name kings. Now Prussia had a semi-democratic constitution, but really the nobility with land (the Junkers) had the power, especially in the east. In 1862 Prussian King William I named Otto von Bismarck as the new Minister-President (prime minister). Bismarck wanted the liberals and the conservatives to lose. He wanted to create a strong united Germany, but under the Junker, not under the western German liberals. So, he started three wars:* with Denmark in 1864 – this gave Prussia Schleswig-Holstein* with Austria in 186] (Austro-Prussian War) – this allowed Prussia to take Hanover and most other north German territories who were with Austria* with France in 1870 (Franco-Prussian War) - so Bismarck could control Mecklenburg, Bavaria, Baden, Württemberg and Saxony. After this, these states (but not Austria) became part of a united German Empire, and William I took the title of Emperor (Kaiser). This was Prussia’s high moment. The economic and political future looked good, if the leaders were clever. But after 99 days, in 1888 the state had a new leader, William II. He had little experience and little imagination, and he made bad plans. Bismarck lost his job in 1890 and William II started a new foreign policy. He started a military program and took risks; this took Germany into World War I. The Prussian Junker controlled the war, so when they lost, it was the end for them. The Prussian king and all the other German kings lost their power. Germany became a republic. In 1919 the Treaty of Versailles re-created the Polish state, and Prussia had to return a lot of land. The Polish Corridor was between East Prussia and Germany. At the end of World War I some people wanted to break Prussia into smaller states. But tradition won, and Prussia became the "Prussian Free State" (Freistaat Preußen), the largest state of the Weimar Republic, with 60% of its land. The industrial Ruhr area was in Prussia, and also Berlin, so Prussia was the home of the left. The Social Democrats and the Catholic Centre had power for most of the 1920s. In 1932 Germany's conservative Chancellor Franz von Papen took control of Prussia, ending the state’s democratic constitution. It was the end of German democracy too. In 1933 Hermann Göring became Interior Minister of Prussia; he was now very strong. In 1934 the Nazis took the German states’ power. In 1945 the Soviet Union’s army took all of eastern and central Germany (and Berlin). Poland took everything east of the Oder-Neisse line, e.g. Silesia, Pomerania, eastern Brandenburg and East Prussia. The Soviet Union took the northern third of East Prussia, including Königsberg, now Kaliningrad. About ten million Germans had to fly from these areas. Polish and Russian people moved there to fill the area. Because of this, and because the Communists took control of land in the GDR, the Junker and Prussia were finished. In 1947, the United States, Britain, France and the Soviet Union formally agreed the end of Prussia. In the Soviet Zone (from 1949 the GDR) the Prussian lands were now the states of Brandenburg and Saxony-Anhalt. The Prussian parts of Pomerania went to Mecklenburg-Western Pomerania. In 1952, the GDR government stopped using states and used districts. In 1990, the end of the GDR, the states returned. 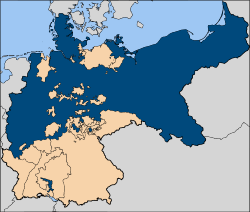 In the West (from 1949 the Federal Republic of Germany), the Prussian lands went to North Rhine-Westphalia, Lower Saxony, Hesse, Rhineland-Palatinate and Schleswig-Holstein. Baden-Württemberg took the Hohenzollern land. The idea of Prussia is not completely dead in Germany. Today some people want to put together the states of Brandenburg, Mecklenburg-Vorpommern and Berlin and call them Prussia. But German politicians are not interested in the idea. The constitution of Berlin allows for Berlin and Brandenburg becoming one state, but the people of Berlin said no in a vote. "Cartographica Neerlandica Background for Ortelius Map No. 56". orteliusmaps.com. http://www.orteliusmaps.com/book/ort56.html. Retrieved 16 April 2010. "Le Miror du Monde, Seite 70". uni-mannheim.de. http://www.uni-mannheim.de/mateo/desbillons/atlas/seite70.html. Retrieved 16 April 2010. Map of Old Prussia by K. Henneberger, 17th century. Map of Prussia and Freie Stadt Danzig from 18th c.
This page was last changed on 17 September 2014, at 18:03.